602 pages | 67 B/W Illus. Town and country planning has never been more important to the UK, nor more prominent in national debate. Planning generates great controversy: whether it’s spending £80m and four years’ inquiry into Heathrow’s Terminal 5, or the 200 proposed wind turbines in the Shetland Isles. On a smaller scale telecoms masts, take-aways, house extensions, and even fences are often the cause of local conflict. 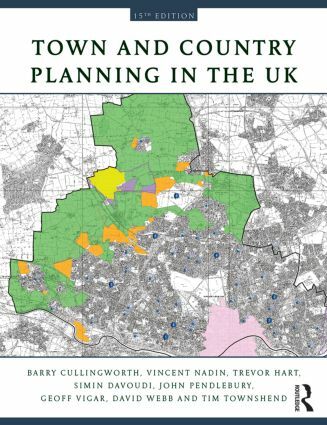 Town and Country Planning in the UK has been extensively revised by a new author group. This 15th Edition incorporates the major changes to planning introduced by the coalition government elected in 2010, particularly through the National Planning Policy Framework and associated practice guidance and the Localism Act. It provides a critical discussion of the systems of planning, the procedures for managing development and land use change, and the mechanisms for implementing policy and proposals. It reviews current policy for sustainable development and the associated economic, social and environmental themes relevant to planning in both urban and rural contexts. Contemporary arrangements are explained with reference to their historical development, the influence of the European Union, the roles of central and local government, and developing social and economic demands for land use change. The many recent changes to the system are explained in detail – the new national planning policy framework; the impact of the loss of the regional tier in planning and of the insertion of neighbourhood level planning; the transition from development control to development management; the continued and growing importance of environmental matters in planning; community engagement; partnership working; changes to planning gain and the introduction of the Community Infrastructure Levy; and new initiatives across a number of other themes. Notes on further reading are provided and at the end of the book there is an extensive bibliography, maintaining its reputation as the ‘bible’ of British planning.